There were 13 panels giving an overview of the exhibition. 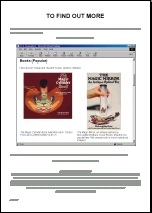 Since they contain a lot of graphics, they have been split into separate PDF files. 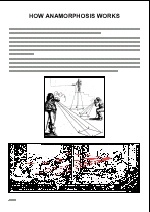 Click on any thumbnail to view the PDF (the file size in Kbytes is given in brackets). 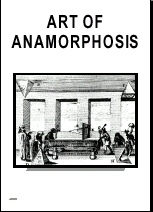 The following books and articles were provided to allow investigation into the art, history and techniques of anamorphosis. 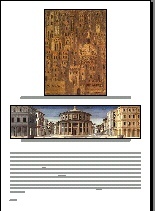 Hidden Images: Games of perception, anamorphic art, illusion, F. Leeman, J. Elfers and M. Schuyt. Harry Abrams, New York, 1976. What the Painter Sees. Kingfisher, London, 1996. Perspective, Vredeman de Vries. Dover Books. Civilisation, Kenneth Clark. BBC Books/John Murray. The Ascent of Man, Jacob Bronowski. BBC Books. 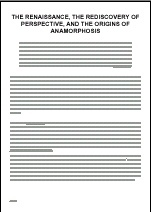 "Anamorphic images", J.L. Hunt, B.G. 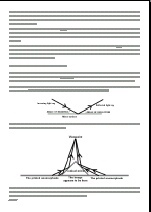 Nickel and C. Gigault, American Journal of Physics, volume 68, part 3, pages 232-237 (March 2000). Perspective and Other Drawing Systems. Fred Dubery and John Willats. Van Nostrand Reinhold, New York, 1983. CHAPTER 1 FROM Perspective in Perspective, Lawrence Wright. Routledge & Kegan Paul, London, 1983. CHAPTERS 10 AND 11 FROM Mathematics in Western Culture, Morris Kline. Penguin Books, 1987. 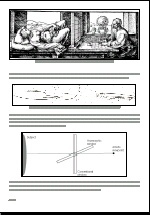 CHAPTER 2: "ALBRECHT DURER" FROM Geometry and the Liberal Arts, Dan Pedoe. Penguin Books, 1976. On Reflection by Jonathan Miller. A TV series which accompanied a 1998 exhibition at the National Gallery in London. See also the book on the Reading Table. 35 minutes. The Ambassadors: Making and Meaning. National Gallery, London. 30 minutes. Restoring the Ambassadors. National Gallery, London. 50 minutes. 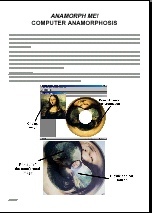 Art of Anamorphosis web site - a "local" (not network-connected) copy of the web site you are currently looking at. 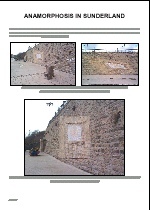 István Orosz: the personal web site of the Hungarian artist, many of whose works are on display in the exhibition. www.kellyhoule.com - Kelly Houle is an anamorphosis artist in Arizona, USA. One of the computers had a web cam - which could be used to take a picture of yourself, and then put this into Anamorph Me! to make an instant anamorphosis.